The United Nations High Commissioner for Refugees (UNHCR) estimates that by the end of 2016 some 65.6 million people were forcibly displaced worldwide–a number not seen since the end of World War II. On average, 20 people were driven from their homes every minute last year. The challenges faced by vast numbers of migrants and refugees uprooted by war, persecution, ecological crises, natural disasters, or even relocating in search of economic opportunity, are often urgent, and, unfortunately, all too familiar. The movement of populations has spurred–and continues to spur–great changes in the cultural landscape in general and design in particular, both positive and problematic. Displacement creates opportunities for cross-cultural dialogues and inspires design solutions, whether they be related to objects used for disaster relief, temporary housing for displaced persons during wartime or following natural disasters, or more substantial and lasting interventions into the landscape, such as the exponential and necessary growth of cities. 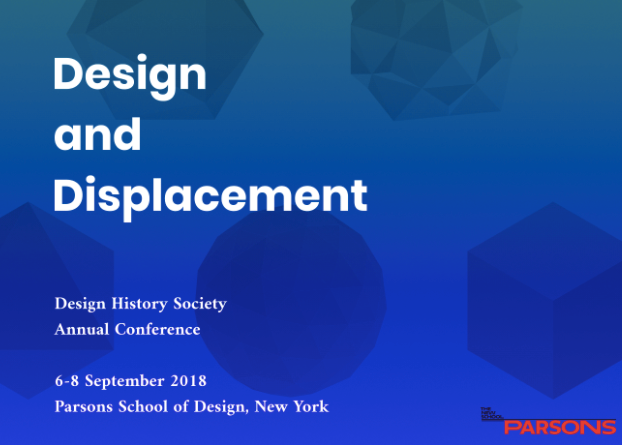 This conference will examine displacement and attendant issues from a design perspective. In addition to the current displacement of people and populations, papers can consider the theme more broadly and historically, including connections among displacement of objects and styles, changing technologies, and broad geographies and histories related to landscapes and urban development. We invite contributions from design historians and scholars and academics in related fields as well as practitioners, design educators, museum professionals, and students. Individual papers of 20 minutes, or proposals for full panels of three papers related to the samples or relevant to the theme of displacement, will be considered. Panel proposals must include abstracts for all three papers in addition to a short description of the panel theme. The Design History Society offers many bursaries for student speakers whose abstracts have been accepted and who are members of the Design History Society. This entry was posted in Events, External Partnerships, HOME SLIDER, Public Programs. Parsons Highlight: History of Design and Curatorial Studies MA Highlights. Program: History of Design and Curatorial Studies MA. Bookmark the permalink. Both comments and trackbacks are currently closed.